The new brochure of Mazars in Vietnam has been released. This brochure presents our capabilities in Vietnam. 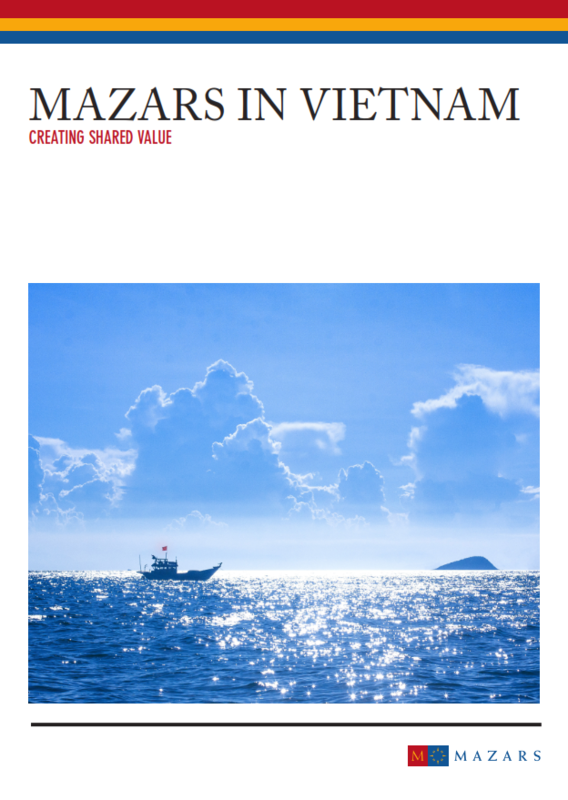 The new brochure of Mazars in Vietnam has been released. The publication is available in English. Please scroll down to download the latest version. Mazars is an international, integrated and independent organisation, specialising in audit, accountancy, tax, legal and advisory services. As of 1st January 2018, Mazars and its correspondents operate throughout 103 countries. 86 of these countries are part of the Mazars integrated partnership and 15 are Mazars correspondents. We draw on the expertise of 20,000 professionals to assist major international groups, SMEs, private investors and public bodies at every stage of their development. The Praxity Alliance offers Mazars operating capacity via professional teams in 21 additional countries. Mazars in Vietnam was established in 1994 to provide professional accounting and business advisory services to foreign and local organisations and has since grown to become one of the premier mid-tier firms in the country. We currently provide services to a variety of clients from our offices in Hanoi and Ho Chi Minh City. Our clients are both large and small and operate across all commercial, industrial and Not-for-profit sectors. Mazars is now ranking in Top 10 audit firms and the leading firm with respect to Accounting Outsourcing Service in Vietnam. We are well known for providing high-quality professional services and have the ability to communicate well in English, French and Vietnamese. With around 160 staff, our multi-disciplinary team of professionals comprises Chartered Accountants, Certified Public Auditors, Tax Lawyers, Masters in Accounting and Finance, Masters in Business and Administration and Cost Accountants, who are all well equipped with the requisite business and technical skills, experience and knowledge base to deliver customised solutions to our clients. With their respective competencies, our professionals are capable of developing competitive advantages and sustainable values for a wide range of businesses.